Personalized Make Up Brush Sets in Bulk. Clearance Sale: Only $0.75 each! Custom Make Up Brush Set Personalized in Bulk. Promotional, Very inexpensive. Custom imprinted Make Up Brush Sets st a bargain price. 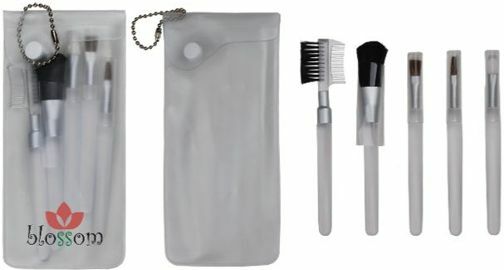 It is a translucent cosmetic brush set in a translucent bag with a white snap button and silver chain. It includes 5 brushes: blush brush, eye shadow brush, lash and brow rush, lip defining brush and smudge eye sponge. We also supply wholesale blank (not imprinted) Make Up Brush Set at EQP (End Quantity Price). Budget Prices in USA and Canada for promotional Make Up Brush Sets. American clients pay no taxes. Setup Charge: $35.00 per make up set; $20.00 on re-orders. Additional Colors: add $0.25 per make up set. • Attractive Transluucent Bag with a White snap button. Colors: Clear Case with Brushes with Clear Handles. Imprint Area: 1-5/8" x 3". Packaging: Individual polybag. 300 per carton @ 21 lbs.